Antique Bijar Rugs is a town in Persian Kurdistan located in north-west Persia. The Bijar name is also used to describe the antique rugs that were produced in the many villages in the surrounding vicinity. The Bijar is noted as being the stiffest carpet made; they are very heavy in relation to their size, and very thick and durable. All of the knots are symmetrical and the rows are beaten down during the weaving process producing a dense compact fabric. Given their thickness and construction Bijar rugs can be difficult to fold. The many designs depict the Kurdish influence of the area and often floral and classical geometric motifs are employed as well as the use of large, whimsical medallion designs. The color palate is rich and jewel toned making the Bijar a highly desirable rug sought after by designers. Bijar rugs, produced in Northwest Iran are among the finest of Persian rugs by virtue of their design and technique. They cannot be identified readily by their patterns, for their repertoire is quite rich and varied. They are distinguished by primarily by their weave, which is perhaps the densest and most durable of all oriental rugs. Bijar carpets were produced in a classical medallion format as well as in allover designs and pictorial or garden patterns. 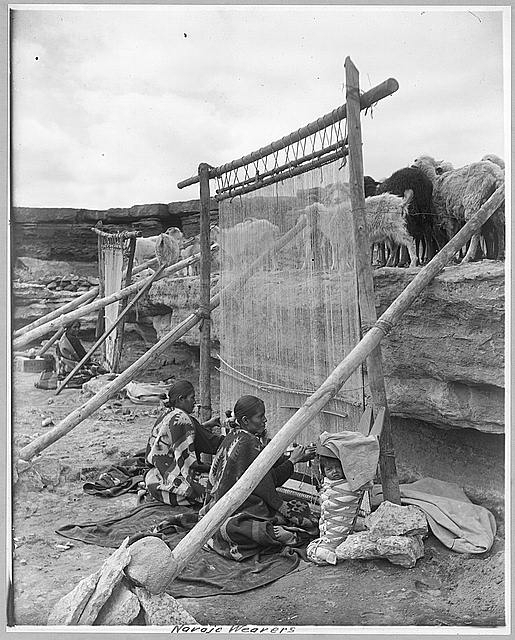 The quality of their wool is lustrous and soft, the drawing at times classically precise or wildly tribal. Some are attributable to Kurdish weavers living in the Bijar region. 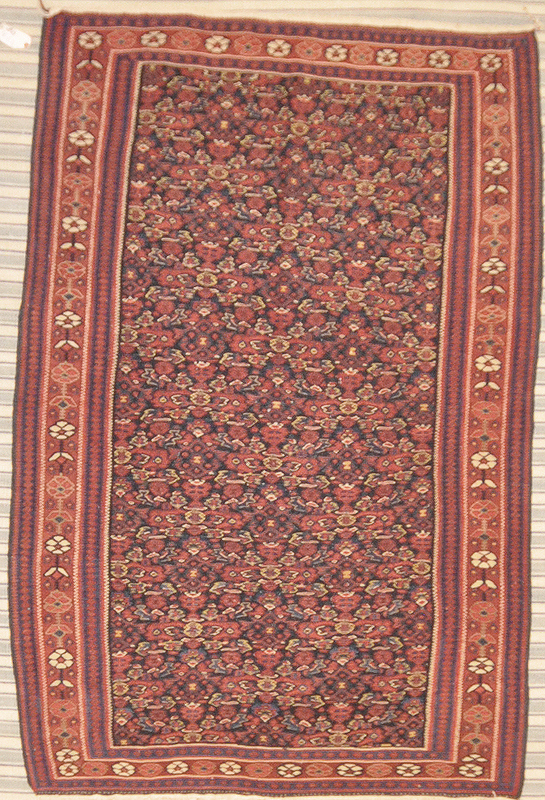 Bijar rugs, produced in Northwest Iran are among the finest of Persian rugs by virtue of their design and technique. The city of Bijar is located in the province of Kurdistan in the heart of Northwest Iran. Bijar lies between the city of Senneh or Sanandaj to the south and the legendary weaving center of Tabriz to the north. Kurdish tribes have traditionally been the region’s endemic people. However, the Afshari tribe also produced many Bijar’s workshop rugs using patterns borrowed from Heriz, Tabriz and other great weaving centers of Northwest Persia. Geography plays a tremendous role in the history of the production of antique rugs from Bidjar. Although the Kurdish tribes have always been a dominant group in the region, they are one of the few cultures in the world who have never had their own country. Bijar’s carpet weaving traditions were formed through a combination of cultural isolation and assimilation that is evidenced in the diverse range of designs used in the region as well as the continued use of natural dyes throughout the 1920s when many other regions adopted modern methods. The rugs of Bijar encompass a broad range of styles and patterns that makes them difficult to define or distinguish from other regions. The color palate is rich and jewel toned making the Bijar a highly desirable rug sought after by designers. Although Bijar was first mentioned in the 1500’s when the region was annexed with Armenia by Safavid forces, archeological evidence of domestic technology and weaving implements dating back approximately 10,000 years has been found throughout Kurdistan. Situated in a corridor between the border of Persia, Anatolia and the Caucasus, Bijar has been at the mercy of invading cultures for thousands of years. Military invasions from Russia and Europe have influenced Kurdish culture as early as 500 BC when Cyrus the Great launched a large-scale incursion into the region. The turmoil across Northwest Persia and neighboring countries continued through the 1800s with ongoing fighting related to the Russo-Turkish War. Over the centuries, Kurdish influence has waxed and waned as neighboring empires were distracted with their own wars. At the height of Kurdish power, the group claimed parts of neighboring Turkey and Azerbaijan. However, the Kurdish people had almost always been a subordinate tribal group that was part of a larger empire. The city’s untimely establishment on the world’s maps coincided with the re-establishment of shipping ports and the gradual decline of the Silk Road. This shift changed the course of events in Bidjar and allowed the city to maintain its weaving traditions into the early 20th century. Influences from Persia, Russia and the Caucasus can be seen in Bijar’s diverse rugs, which include European roses, curvilinear arabesques, inset-lozenges featuring intricate Herati and Mina-Khani patterns, and Serapi-style medallions set on a stark background. The designs used on Bijar rugs often include sophisticated patterns with small details that highlight their origin in the village workshops of tribal weavers. 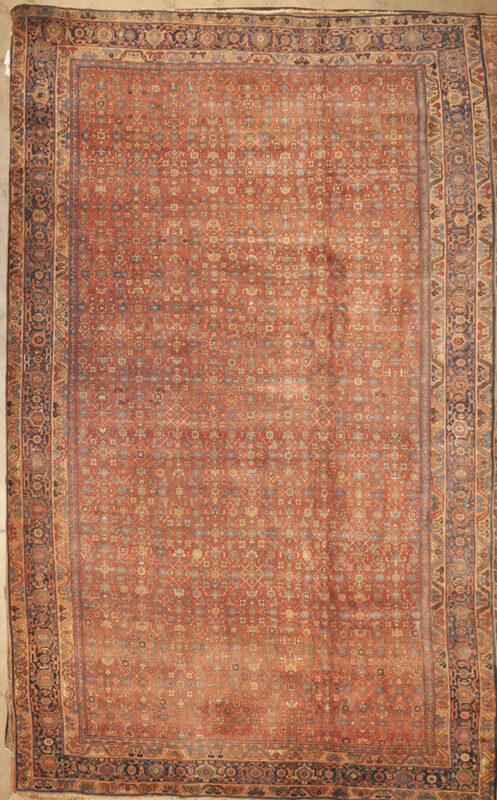 Examples of weavings from Bidjar include small-format rugs as well as long corridor carpets. However, large-format pieces are relatively rare. Rugs from Bidjar are known for their durable construction and strong, raised pile. Weavers in Bidjar used double weft or double knot construction along with a number of implements to create an extremely firm pile using the symmetric Turkish or Ghiordes knot. A small number of Bijar rugs were also produced using the asymmetric Persian knot along with traditional curvilinear patterns from Persia. 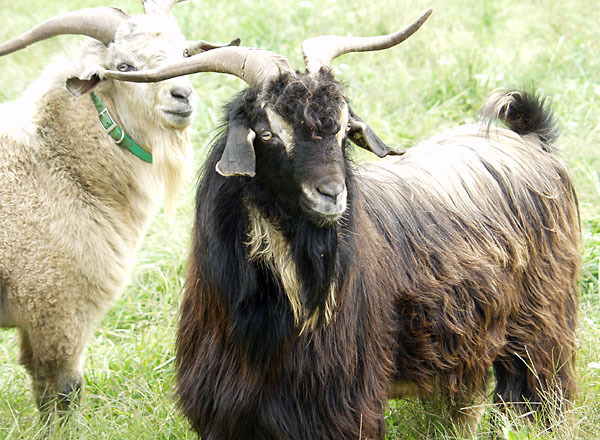 Goat hair is another fiber that is occasionally seen in rugs from the region. Weavers in Bijar used a unique combination of yarns for the weft to create the signature look and feel of the firm pile. First, a dampened shoot of thick weft is inserted and tamped down with tools to secure the knots. The weaver follows this with a second shoot of finer yarn to secure the entire row in place. Wool is the most common foundation found in antique Bijar rugs. However, cotton was also used. Many of the oldest Bijar rugs are extremely coarse and incapable of being folded while later pieces and rugs produced in the neighboring village of Halvai tend to be thinner and finer. Rugs signed by the legendary master weaver Tajhavi (Taghavi) are among the finest and most prized carpets from the Kurdistan province displaying impeccable workmanship. Bijar is a small city in a sparsely populated province with a rich carpet weaving tradition. The resulting pieces are as diverse as the groups who first created them and their varied designs make antique Bijar rugs equally fitting for traditional and modern interiors. Bijar is a town in Persian Kurdistan located in north-west Persia. The Bijar name is also used to describe rugs produced in the many villages in the surrounding vicinity. The Bijar is noted as being the stiffest carpet made; they are very heavy in relation to their size, and very thick and durable. All of the knots are symmetrical and the rows are beaten down during the weaving process producing a dense compact fabric. Given their thickness and construction Bijar rugs can be difficult to fold. The many designs depict the Kurdish influence of the area and often floral and classical geometric motifs are employed as well as the use of large, whimsical medallion designs. 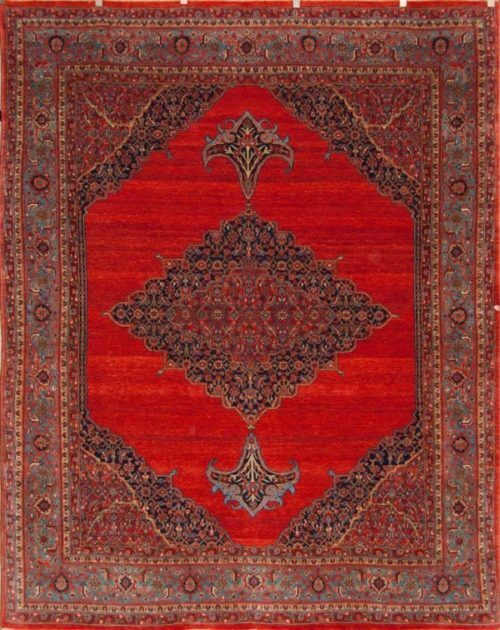 The color palate is rich and jewel toned making the Bijar a highly desirable rug sought after by designers.